I am not a good cook. I have a few recipes I make passably, but there are few things I cook that could be called brilliant. Luckily for me, I am surrounded by great cooks like Nancy Reed and my step-grandmother Caroline Adler, so I only have to contribute a side dish or a bottle of wine to typical meals. One of the few things I do cook well is Colcannon. Most Irish families have a recipe for this potato, cabbage mixture. Mine was passed on from my grandmother, but I've added my own twist to it. Truth to tell, I make a huge pot of it and eat it for days, sometimes as a solo meal. Boil potatoes until just tender. Mash them with plenty of butter. Heat up milk, and mix it in until fluffy. Salt and pepper. Basically make mashed potatoes with a bit extra moisture. Use plenty of butter. Heating up the milk is critical to the fluffy part. Chop up some cabbage. I use an entire small head, but you can use less. Put butter in a frying pan, add an onion, and the cabbage. Cook for about 15 minutes until the onions are clear, and the cabbage is softer. I like mine a little crisp, but this is up to you. Mix the potatoes and cabbage together. Now, here's my twist. Grate some cheese--whatever kind you like. My favorite is a sharp cheddar. Maybe a little Swiss. I use a cup or two, depending on how much potato/cabbage mixture I have. Put the whole thing into a baking pan, sprinke some cheese on top, and put it in a 350 degree oven for 20 minutes or so. This is a perfect side dish any time of the year, but especially for winter meals. Do you make Colcannon? What twist do you add? 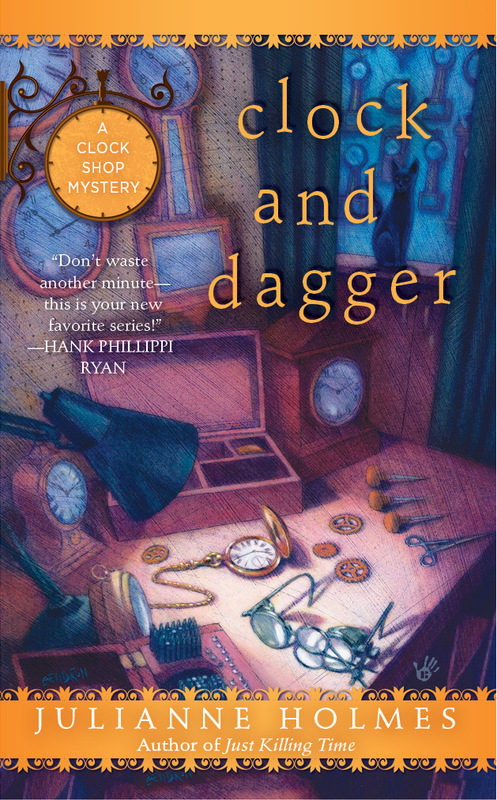 Julianne Holmes writes the Clock Shop Mystery series. Chime and Punishment will be out in August! Sometimes I wonder if all the variations of potato/cabbage dishes in Ireland are just an excuse to eat lots of butter. Not that I'm complaining! And there are plenty of cows willing to contribute. LOL. It may be--I was "off" butter for a while, going for low fat. Now the news that a little fat is good has me rejoining the butter brigade. Would LOVE to go to Ireland and taste their many versions. I love to add baby kale to mine to give it a little color. Yum--I bet that does look better, and probably tastes good too. Will remember it for next time! Hi Ruth (and Julianne) my twist is stirring in chopped cooked bacon. And Sheila is right about the butter!!! Bacon. Why didn't I think of that? Perfection. I have never heard of Colcannon before, but your recipe sure makes me want to try it! My favorite instruction: mash them with plenty of butter!! Butter makes everything better for sure!